Micro Preemie Twins: The Story of Holland & Eden: Dancing Queens...In Training! They look so cute! Congratulations on your Tiny Dancers! Please video their performance in June! They are so happy and adorable in these pics! This is helping restore some of my faith in humanity after reading some recent posts on another blog where the mother is having issues making sure her son is included (he was so sad he disabled his powerchair in an attempt to get out of kindergarten, how sad is that?!). It is amazing how little it can take to be inclusive and how much it means to the person. Please post video of their recital when they have it, I'm sure I am one of many who would love to watch those two little cuties dance their hearts out =)! Oh and you are not a lazy blob, you are a hard-working over-stressed mommy who needs a break. And I saw some bulbs peeking up in the courtyard in my building so it seems spring might come after all =D! you know we're going to need video, right? Billie, it is just divine to see how your girls are being successfully included in this dance class, it is really very very special to witness and I can't wait to see the video in June! How cute, I'll just start crying now and maybe by June I'll get through the performance. Sure that won't work. They sure are cute. So glad that all 4 cousins get to dance together this year. I can still hear Eden saying "What about me?, I can do that." This year she can!!! Oh wait, it will be 5 cousins won't it!! Lucky Nana, all of them at once!! Can't wait!! Love you guys! I've been reading your blog for a while, but I didn´t comment before. I´m a 22 year old girl with a spastic dyplegia CP. 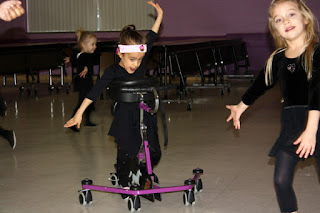 And I just want to say that makes me so happy to see Eden in a regular dance class (my mom never found one when I was a little girl) and enjoying it so much! Actually, I wanna to thank you (Billie and Eden,too. And thank you Eden for give me strengh in my tough days. very cute pictures. I'm fairly new here and your recent visits to the er has me curious as my son has had croup and now is coughing really bad. I'm so sorry you've had a rough time with both your adorable daughters visiting the hospital with RSV. that's rough. Now, pass the wine, right? Thanks again for your inspiring family! Looking forward to seeing more photos and video of their performance. I haven't posted in a while but have been following you guys for the past 2 years. This post made me so happy. I can't believe Eden is out there asserting herself and enjoying every moment on the dance floor. Good for you and hurray for your 2 sweethearts. They are simply amazing. You must be so proud. They are so beyond adorable!! 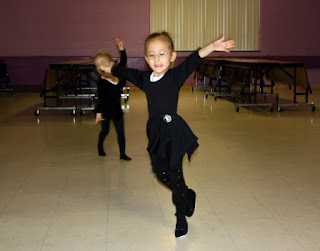 I did ballet for eleven years and taught a class for little ones and we had triplets, one of whom had one leg that wasn't developing like it should. We did a lot of accommodating and adjusting for her too. 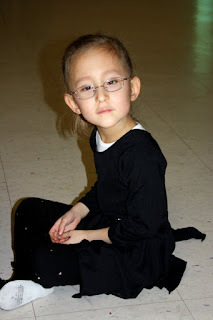 I cried when she learned to skip. Damn straight, Eden's gonna do it all! They are ADORABLE as always - love it! Oh Billie, your dancers are precious and looks like they are loving every minute of it. I am so happy for you and especially for them. This could be just about the cutest thing I have ever seen! Adorable! I can't wait to see pictures from the show in June! You are such a great mom - keeping the girls so involved in everything! My next mission is to find something like that around my house for my daughter! Too cute! Oh Billie, I just teared up thinking about how proud of a mama you must be watching them. Oh you deserve some happiness and rewards. Got all teary-eyed looking at those pics and then again reading Bea's comment. Well done to the girls. That is awesome. How Awesome is that! They look so cute all dressed in thier little outfits! Amazing! I'm so glad the girls are having so much fun with the class, I know how apprehensive I get before I sign mine up for something like this, wondering how in the world Hannah will fit into the mix. Sometimes our kids just lead the way...and it seems like Eden is definitely doing that! They look great, it's inspiring me to get out there more with my girls, doing fun stuff and not so much therapy! Amazing! I love it! Your girls continue to inspire! Oh my gosh - that is so incredible. Kudos to you for even thinking of putting Eden in class right along with Holland. That's something i would have never even thought of. It's so amazing you guys encourage her to do everything she possible can. She is going to melt the hearts of everyone when she strolls out on stage. That's one recital I'd actually like to attend! That is so so sweet! I love it! They are adorable! 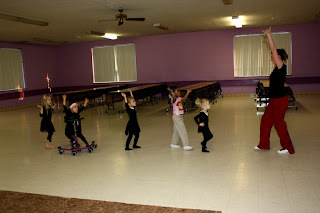 The ballet class is an excellent idea. I love stories like this. 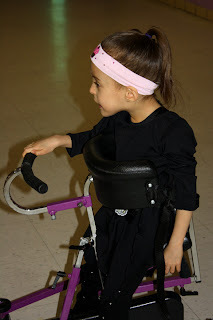 A young girl with CP in our community performed an ice skating routine with her walker, skates and all. It was very impressive. My sister met a blind man who could ride a bike at age 8. He momorized the cracks in the sidewalk so he knew where to turn and spent hours a day riding his bike. AMAZING! The most amazing part is that his parents were willing to let him try riding a bike in the first place. Good for you Billie! You ARE that mom! I believe you are all an inspiration and it's amazing that you continue to do the things that you do. You are blessed with a beautiful family, and we are blessed to know you. We can't wait to see your recital.